Bark Wattle ( Acacia decurrens, MIMOSACEAE ). 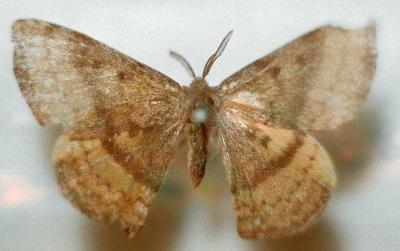 The adult moths of this species are brown with various dark zigzag lines across each wing. Each forewing has two areoles. The moths have a wing span of about 6 cms. Melbourne University Press, 1990, pl. 13.3, p. 395. Part 4 (1855), p. 899, No. 20.